Are culture and brand one of the same thing? As a business coach, I often talk to the businesses I support about their brand and creating a brand personality as a way to build connections with their customers/clients, and when I worked for a large global food company we worked on making sure that the brand personality we wanted to portray in our marketing was the one that consumers could relate to. I worked on the Chicken Tonight brand for many years in the 90s and we did many a consumer group asking our consumer (loyal fans) the question “if chicken tonight was a celebrity chef, who would it be?” We ultimately wanted to say someone like Ainsley Harriot rather than Gordon Ramsey, nothing wrong with either of these chefs however their on-screen persona is very different! And now that I work with organisations to look at their culture & what can be done to not only retain good members of staff but also recruit the best people into the organisation it got me thinking. Your brand is what it looks like on paper/screen/products but ultimately your brand is really how it makes people feel, they probably won’t remember what your brand looks like but they might remember the poor customer service they received. Your company culture is not what you do but how you do it, ultimately its how it makes people feel be this internally with your employees or externally with your customers & clients. Now I’m not saying that good branding doesn’t count as I know many very talented graphic designer who create fantastic branding and brand guidelines which help organisations to set the expectation for their brand & the values they seek to be known for. 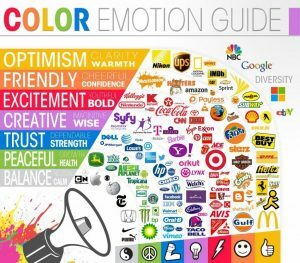 There is a whole science behind branding and colours psychology as illustrated in the image below which I won’t go into as I know next to nothing about it, although it does fascinate me!! The more and more work I do around workplace health and wellbeing with organisations I’m drawn to the culture of the organisation as for me, wellbeing in the workplace simply starts with how someone feels at work – connected with, respected and accepted by the people around them. And if I think about workplace culture the same words come to mind. I know that no matter what wellbeing initiatives are implemented in a business it’s the culture that will determine whether they are successful or not. However the challenge that is faced is that culture is often seen as intangible, how do you measure it? What does good culture look like? and the same could be said for branding?! One area that is emerging in the UK is employee branding – the idea behind this is to create a workplace culture where people actively seek out roles in the organisation as they believe it’s a great place to work and will be good for both their career and wellbeing. As consumers/customers we are more savvy about the brands and organisations we buy into and many people myself included seek out organisations who not only offer good products/services but also treat their staff well, I want a clear conscious that I’m not supporting an organisation who doesn’t pay their the minimum wage for example or treats employees badly. When you have a great workplace culture, the brand sells itself as the people in the organisation personify the values of the brand.